Mary Doyle Keefe was a 19-year-old phone operator in Arlington, Vermont, when Rockwell called and asked if she wouldn’t mind posing for the soon-to-be iconic cover. Read the Post’s 2013 interview with Mary, who passed away this week at age 92. Plus-sized? Mary Doyle Keefe, who posed for this painting, was a petite woman in real life. Rockwell would apologize for painting her so large. On the evening of June 6, 1994, the 50-year anniversary of D-Day, Jay Leno did a special tribute on The Tonight Show. He introduced several World War II veterans who were sitting in the audience before he presented his next guest, Mary Doyle Keefe. 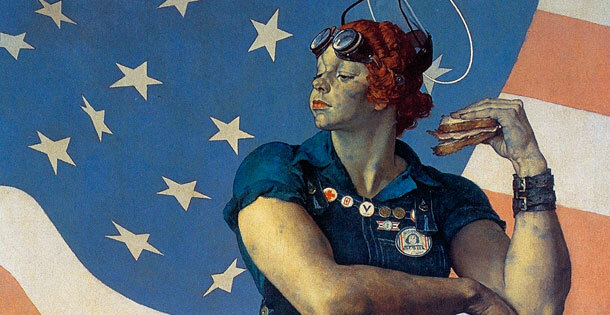 Mary was the model for Rockwell’s May 29, 1943, cover Rosie the Riveter. As Vicki Randle, a member of The Tonight Show band, sang the song “Rosie the Riveter,” Mary drilled several screws into a board making the drill sound at the end of the song. Mary was also a special guest at Sotheby’s when they auctioned Rosie the Riveter on May 23, 2002. The painting sold for $4.9 million to the Elliot Yeary Gallery in Colorado, and has since been sold to the Crystal Bridges Museum of American Art in Arkansas. Even today, Mary autographs Rosie the Riveter posters for people, and happily reminisces about the time she danced with Leno on The Tonight Show.